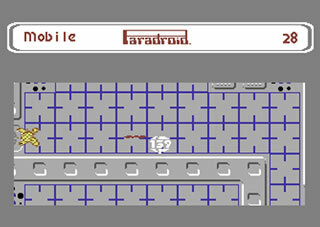 Paradroid was one of those games those over a certain age waxed lyrical over, but under a certian age nobody is sure why. Paradroid, made by legendary programmer of Uridium (amongst others) Andrew Braybrook, has won game of the year awards in the mid 80’s. But what of the game itself? The game is one of the first games I ever played, and remember it was a game that – despite being on tape – had one of the shortest loading times I can remember (I originally stated around 10 seconds, but I have been reliably informed that it was a lot slower). This is something that’s usually missed off reviews, but as a way of reviewing a game that is always talked about, I’m going to mention it. The game takes place on a spaceship, the human crew of the ship had been killed by the robots, who have turned against the crew. The spaceship is heading towards earth, and such is the size of large spaceships of the future, they will destroy earth if colliding with it. The only defence? An influence device, which can take control of the more powerful robots on the ship, so you can obtain firepower from within the site and destroy the ships from within. The game is remarkably huge and atmospheric. There were clever methods of generating suspense by only showing rockets in your field of view. Some of the high security droids (with the number of “999”, your number was “001”) fired a piercing laser that killed your low powered influence droid in one shot, so it did become a game of cat and mouse if you were stranded on the barrack deck or security deck with your influence device. This, along with the moody atmospheric sound effects, add to a remarkable atmosphere on 64k. The game is a traditional top down shoot-em-up seen in more modern games such as Alien Breed and Loaded, but less enemies. Nevertheless, one interesting thing is the weakness of the original character. You have one tactic though – you can transfer to other robots and obtain their power and armour by running into them. A sub game begins where you have to gain control of your robot by gaining control of it. This is done by plugging in your colour into grid in the centre of the screen. If you win you gain control of the robot, if you lose you end up either back as your influence device, or dead. If you win, you assume the power of the robot you took over, but only for a short time. This was where the skill came in. The higher power robots lasted a shorter length of time than the weaker robots, so part of the games strategy was to wipe out robots on similar levels using similar robots. Attempting to destroy higher levels with stronger robots used to be a race against time, as often you had to begrudgingly give up a strong robot to a slightly weaker one. And all in one of the shortest loading times ever. Instead of just firing, you had to think about where to go and your next move, which made this game atmospheric and difficult. 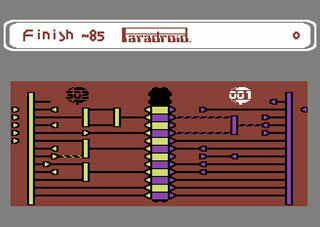 With a unique gameplay element, it differentiated enough to make it as playable today as when it was released in 1985. So much so that it has become one of the most desirable games on the Wii’s Virtual Console, I urge you who have never played this game to get it. I’ve been looking for easily accessible games for the C64, so I’ll have to check this one out! I remember this game being wierd, and difficult, but for some reason i kept going back to it and got better, i never completed it, but am sure i couldn’t have been far off. Great game.